When we jump out of the rigid thinking pattern of art history and pay attention to the history of abstract art, we could see that contemporary artists are still keeping looking for the possibilities of painting language while carefully digesting the impact of the concept. Therefore, the creation of contemporary artists should also be reinterpreted according to the current context. Abandoning the linear narrative of art will reveal the obscured history, and the abstract art has more details than we see on the surface. 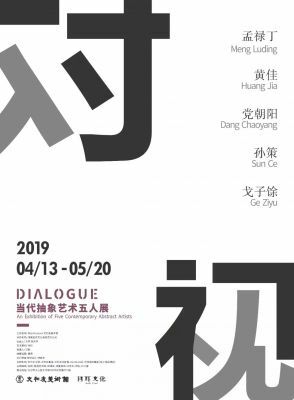 Beginning with a reflection on the combination of abstract expression and conceptual art, Meng Luding turned to present the passion of daily life which has touched him. His concept has properly embedded in his schema symbolized works. Huang Jia added personal temperature, traces, emotions and subjectivity to her art. She didn’t simplify but conceal the meaning of the art works. In the process of calm and restrained painting, she has consistently remained the vitality as a driving force. From the abstract material to the abstract imagery and then to today's abstract creation, Dang Chaoyang can be seen as approaching a "spiritual purification". The dark and deep color gamut reveals a faint bright color, implicating a spiritual direction that the artist tries to seek along with the viewer. Sun Ce’s desires of thinking and expressing are vividly poured into his works. He reveals that if something seems uncertain and is concealed by the so-called true clarity, painting will be more deceptive and fall at the shallow level of materiality. Ge Ziyu's creation concerns more about the visual effects of "something" in various physical forms, applying the intense colors or creating a deep illusion, allowing "something" to reach his imagination of the universe and showing his imagination of infinity and eternity. The five artists' explorations of concepts, emotions, thoughts and language have presented such different results. It is enough to show that even under the shackles of theoretical discourse, each individual artist can extend the boundary of abstract art. In the current state of poetic history, dialogue with history and contemporary will be the ordinary state of the five artists.